This one I was introduced to in college. I remember people telling me that it was this really great series and I read an issue and it just didn't grab me somehow. It seemed too weird or that it was trying too hard to be weird. I didn't understand why people thought it was so great. I came back to it a few years later after I first read the collection, Like A Velvet Glove Cast In Iron, which, similar to Ed The Happy Clown, is just very surreal and a real mindblower. I love the artwork, I love the writing. It was completely addictively bizarre and intelligent and impossible to put down. Immediately after I finished Like A Velvet Glove Cast In Iron I went and tried to find every Eightball issue that I could. So I started buying them as they came out and buying the earlier issues wherever I could find them. I have every issue, there's only 23 of the whole series. He got to a point where he was putting them out very, very slowly - two issues a year, then one issue a year, then one issue every four years - so there's not a whole lot of Eightball issues out there. But I do think it's the greatest series of all time. The development that Clowes goes through from his early work - you can see him in every single issue getting better. The writing and the art and his ideas, I just get so excited by it. I think it's so brilliant, it contains so many emotions, and his incredible sardonic sense of humour. He's definitely one of the greatest writers and greatest artists of any comic book. The series as a whole must've been the equivalent in the '60s of every new Rolling Stones or Beatles or Dylan album that came out - this incredible leap from the one before. You knew that they were already awesome but it was just unbelievable that they would have something new out that went even further than what their previous release had done. And that's what collecting Eightball was like. Each issue was like, "Oh my god, I can't believe he got even better." He would take these turns that were unexpected and mind-blowing, and just reliably great. That's a really exciting thing when you find something like that going on in culture. Clowes really has his feet in an earlier era of comics as illustration, like comic book artists of the '40s and '50s weren't cartoonists as much as illustrators, and Clowes has got the best of both worlds in that sense. He's able to exaggerate and cartoon but he's also very technically adept when it comes to just straight illustration and design. Where a lot of artists are either heavily on one end of that or the other, Clowes is one of the few artists who can have it both ways. He's so adept at both cartooning and illustrating and his style is this synthesis of the whole 20th century's worth of storytelling. In each panel of Eightball it's a combination of so many elements that works perfectly. At least in the old days. I feel like he really lost a lot of that style at a certain point when he started to simplify more and started to get more into trying to remove a lot of those details. 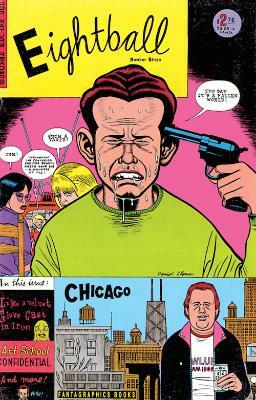 I think Chris Ware had a big influence on some of these artists, trying to simplify, and I don't think that simplification was to Clowes' benefit. I like the earlier mishmash style much better than I like the clearer, simpler style of the later pieces.